The 2019 edition of the College Football Playoff is rapidly approaching. In honor of the imminent final bracket, let's take a look at its history starting in 2014, when the CFB Playoff made its debut. The inaugural playoff featured No. 2-ranked Oregon romping No. 3 Florida State 59-20 in the Rose Bowl and No. 4 Ohio State knocking off the No. 1-ranked Alabama Crimson Tide in a 42-35 Sugar Bowl doozy. The Ducks would prove no match for the Buckeyes in the National Championship Game, losing 42-20 behind four Ezekiel Elliott touchdowns and starting QB Cardale Jones taking over under center. The No. 2-ranked Crimson Tide showed their class and thrashed No. 3 Michigan State 38-0 in the Cotton Bowl. The Orange Bowl featured a closer game between No. 1 Clemson and No. 4 Oklahoma, which saw the Tigers emerge victorious by a final score of 37-17. The National Championship Game was a BARN BURNER as Alabama "upset" the top-ranked Tigers 45-40 behind 158 yards and three touchdowns from running back Derrick Henry. A disappointing semifinal in 2017 featured top-ranked Alabama beating No. 4 Washington 24-7 and No. 2 Clemson shutting out No. 3 Ohio State 31-0. The Clemson Tigers would get their revenge this time around against the Crimson Tide in the National Championship Game on the back of 420 passing yards and 3 TDs by Deshaun Watson, escaping with a 35-31 last-second victory. Meeting for a third consecutive year in the playoff, top-ranked Bama would dominate No. 4 Clemson 24-6 in the Sugar Bowl. The Cotton Bowl was basically a Big 12 regular season game -- No. 2 Oklahoma was taken down by No. 3 Georgia 54-48 in two overtimes. 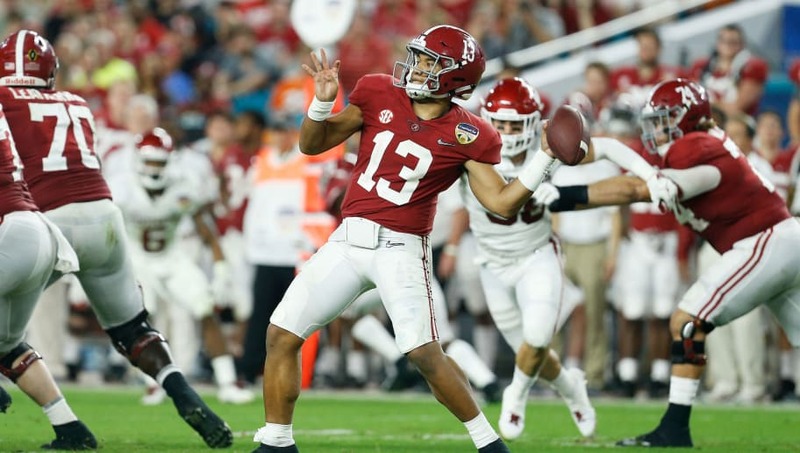 The Tua Tagovailoa legend was born on this night in the final game as he would come off the bench to lead the Crimson Tide to an epic comeback victory in overtime over the Bulldogs, with Bama upending their SEC rivals by a score of 26-23. Clemson dominated previously-undefeated Notre Dame, 30-3, and Alabama handled Oklahoma, 45-34. Alabama faces Clemson for the third time in the College Football Playoff final and fourth year in a row.